The main outline of the film is Father – Son relationship with a good message . Vijay Sethupathi stands out with the old man getup and has emoted very well , it may be a carrier best performance by Vijay Sethupathi . Next to him Ramesh Tilak has done a fabulous work his performance is to be noted and this performance may open many doors for him , in this movie he has tried sentiment too which worked out well ! The Story basically revolves around 3 characters as narrated in the trailer. Actress Aashritha’s role is limited on screen. The Editing part was good and crisp with a short duration. Technically Orange Mittai is good but the big minus is the BGM part , music director Justin Prabhakaran has done something wrong in the BGM part though the songs where good. The Last 20 minutes of the film is a downfall for the movie and the audience leaves incomplete.The movie after presenting itself interestingly in the first half, wanders to Father-Son sentiment and finishes off with “Ah good, could have been better” feeling. 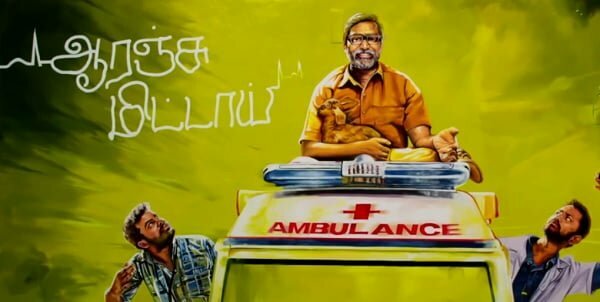 Orange Mittai is a simple feel good movie without much fuss and hype silently will enter into your hearts and leave with a small mark. Verdict : A light hearted film !